Would you like to have a self-replicating machine? What about self-replicating 3D printer? There is a free 3D desktop printer capable of printing itself, or it’s own plastic parts, to be precise. The metal parts and electronics are not printed. Yet. Printer RipRep can print various plastic parts, including it’s own parts. After initial model Darwin came second generation Mendel, the latest stable model is variant Prusa Mendel. Distribution and copying is under GPL like license. Principal author is Adrian Bowyer from Department of Mechanical Engineering, Faculty of Engineering and Design, University of Bath, UK. 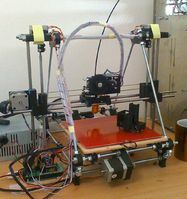 It’s possible to build own printer for maybe less than $700. There is a lot of usefull things, which can be printed, like glasses or shoes. Objects are described by files with extension AOI – Art of Illusion.